Summary: A Swedish company is producing airbag bike headgear. It does not meet the CPSC bicycle helmet standard for sale in the US. They are seeking exemption from the CPSC standard, and BHSI opposes that. The Hövding web page explains their headgear that is based on the airbag principle, with an inflating plastic protective bonnet designed to deploy when the rider crashes. Here is a video of one test crash. 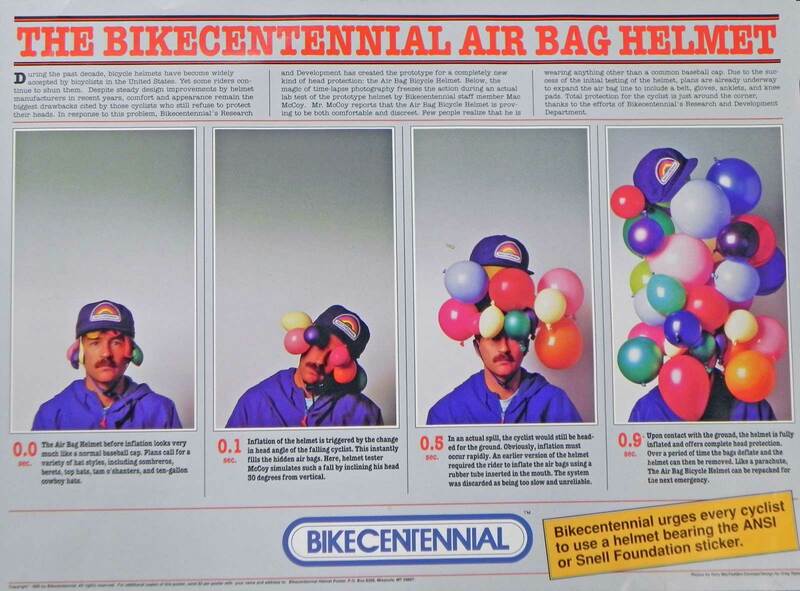 Airbag helmets have been the subject of conversation for years, often accompanied by satiric photos of riders with balloons on their heads. But this one is a serious attempt to put the mechanism to work. On December 17, 2017, the company petitioned CPSC for an exemption from the US helmet standard, proposing to substitute a weaker test. We published an Update newsletter with details. Then we sent detailed comments to CPSC, asking them to refuse the exemption. The device is a project of two Swedish designers who founded the Hövding company, and was in design and development for five years before it was introduced in October of 2010. The designers wanted to create a product that would not cause "helmet hair" and would appeal to those who would not wear a normal bike helmet. The airbag is nylon, and inflates with a gas generator when embedded gyros and accelerometers tell it a crash is taking place. The gyros have to be powered during use, so the Chieftain has a rechargeable battery. That seems like a real drawback to us, since the user has to be aware of the battery charge level (there are led indicators) and remember to keep it charged. Is your phone always charged? After a crash the manufacturer wants the headgear back to check its embedded "black box" for recorded movements prior to your crash. They offer a discounted replacement. A video on the Hovding site shows a test dummy on a bicycle struck from behind by a car indicated as moving at 20 kph (12 mph). The dummy is thrown backwards over the hood and impacts its head on the flat part of the windshield. The bag deploys prior to the impact. That is one specific scenario. But how well did the helmet perform? There is no instrumentation trace visible registering how many g's the dummy head saw. What would have happened to the dummy when it hit the road after the car? And what would happen in a simple fall? Or a collision with a tree branch or utility pole, the mirror of a truck, or the front of a bus or truck? And if the cyclist had not been stationary, but had been traveling at a speed near that of the car? And what if there is another impact after the bag begins to lose air? Nothing in the Hövding web site addresses those questions. Although the device may activate from body motions in some crash scenarios, there are others where the motions occur after the impact, so this reactive device would not cover the full range of impacts that cyclists experience. The greatest danger in using the device would be impacting something with a bare head if the device did not deploy. We are not going to be easy to convince that it will always be there, given the many ways an impact to a cyclist's head can occur. Helmet lab testing normally includes testing wet, cold and hot samples. For CPSC certification they are tested against rounded anvils and curbstone anvils as well as flat ones. The test would have to be of a fully-inflated Chieftain. How well would this device perform against the grapefruit-shaped hemispheric anvil, or the curbstone anvil? Would it perform after being immersed in water for four hours? Would it pass the positional stability test once it was inflated? Would it perform at -15 and plus 50 degrees Centigrade? (That's 5 to 122 degrees F.) All of these questions assume testing on conventional equipment as called out in the CPSC standard, and there are good reasons based on field experience for each of the test parameters. That seems to encompass the Chieftain. Hövding has introduced the device in the European market at a very high price, but is not selling them to US customers. Apparently it is not required to pass the CEN bicycle helmet standard to be sold in Europe. It might simply be certified for the CE mark. At least one test lab says the inflated Chieftan does not pass the European standard. (See Que Choisir testing below) EN 1078 defines a helmet as "an item to be worn on the head and intended to absorb the energy of an impact, thus reducing the risk of injury to the head." That would seem to exclude the Chieftain. Hövding must have some idea of that, but we could not find any reference to standards on their Web site. We did find some info on the SP Labs site, stating that the Hovding passed a series of tests they designed specifically for it, permitting the CE Mark. That is very different from passing the EN1078 helmet safety standard. The CE Mark is not a safety standard like EN 1078. Now the SP labs protcol for testing a Hovding is available attached to the Hovding petition for exemption from the CPSC standard. In 2012 the Swedish insurance company Folksam tested bicycle helmets, including the Hövding. Unfortunately they used unconventional testing methods. They state in the article that all the helmets met the European bike helmet standard, but the Hövding does not, making it misleading to include it with the other helmets. They rated the Hövding highly for one type of test they did, saying it was three times better than the other helmets, but did not even attempt to include it at all in their other tests. And they don't explain what "three times" means. You have to applaud their willingness to take on the challenge of testing the Hövding, but the article really does not provide enough information on the testing to make it useful, and did not even attempt to do a full battery of tests. You can read the article in English attached to the Hovding petition for exemption from the CPSC standard. In 2014 the French consumer magazine Que Choisir reportedly published an article very critical of the Hövding based on lab tests. You can find more in this Råd & Röns article titled Inflatable Bicycle Helmet Does Not Meet the Safety Standard. It notes that the airbag even when inflated failed to protect as well as a standard helmet in the test drops called out by the European standard. The translation: "Hövding refers instead to its "accredited test method" to show that the inflatable helmet meets all safety requirements. Accreditation, however, consists only in letting the Swedish laboratory SP test the helmet according to criteria developed by SP. No third party in the form of a standards authority or other lab has reviewed the test method." There is also a lot of discussion of the article on French blogs. It is highly critical of Hövding's attempts to pass off their test failures as irrelevant. The end of the article recounts a phone call from Hövding threatening Råd & Röns with legal action if they published the article. In 2016 Stanford testers produced this video clip documenting their testing of the Hövding and other tests. The results were immediately picked up by the media and by Hovding's CEO as a full endorsement of the product, although the researchers pointed out that they had inflated the bag with different pressures, not the Hovding standard inflation, and that inflation levels are critical in an airbag. Without the right air pressure, the bag may bottom out and pass all additional energy directly to the head. This Stanford news publication says that "Without the maximum amount of air, the air bag helmet could bottom out, causing the head to hit the ground with much more force than if it were wearing a traditional foam helmet. In current versions of the air bag helmet, a chemical process triggers expansion, which doesn't seem to guarantee maximum air pressure." The researchers did other work to determine what the optimum airbag helmet would be. You can see the results in this journal article for $40. Or without fee you can read the copy attached to the Hovding petition for exemption from the CPSC standard. This YouTube video shows a user who says his Hovding did not inflate when he fell because it was not turned on. He goes on to say that it inflated on another occasion while he was removing his backpack. This YouTube video shows a Belgian Minister testing the Hovding. It does not inflate until after he hits the floor and is rebounding. This YouTube video shows a Hovding failing to inflate in a stunt man's crash. This YouTube video has surveillance video from a supermarket showing a Hovding inflating when a customer jerks after slipping briefly, although the customer did not fall. 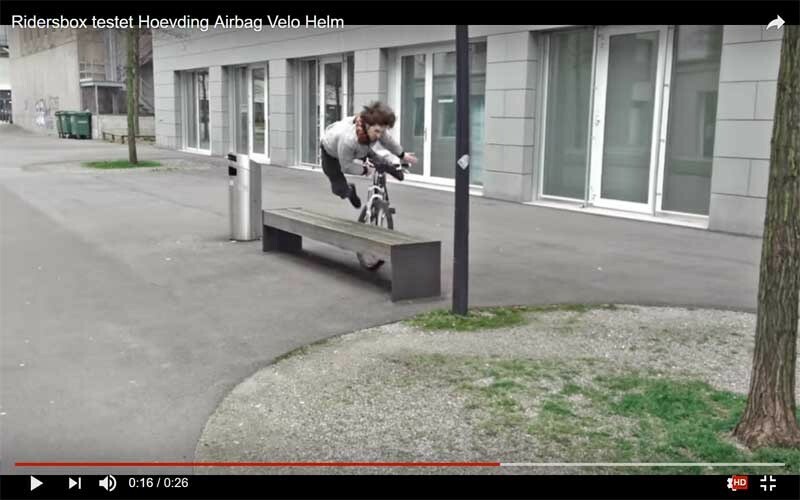 This YouTube video has surveillance video high above a street showing an airbag helmet inflating when a cyclist is riding in a normal way and did not fall. The next frame would show the Hovding just beginning to inflate. 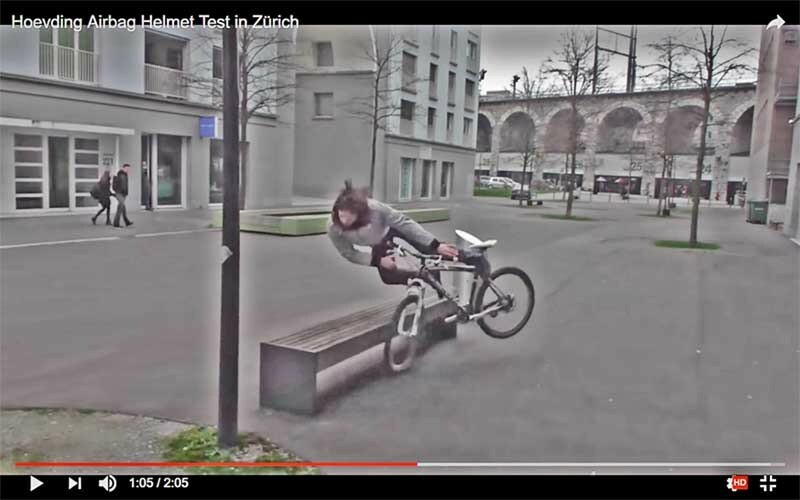 In numerous other demonstration videos found online the stunt riders carefully avoid any contact with a stanchion other than with their shoulder or a part of the bicycle, since a direct head impact would be unprotected by any airbag deployment and very likely to cause serious injury. Andrew Stadnik, Ian Hall, Michael Nelson (Directorate for Laboratory Sciences), Richard McCallion (Office of Hazard Identification and Reduction), and other CPSC staff meeting at the request of Nancy Nord of OFW Law representing a European maker of protective head gear for cyclists that is not the shell-type helmet. The company is interested in introducing its product in the U.S. but the product would not pass the test method specified in 16 CFR 1203. The product is tested to the European requirements (SP-Method 4439). The firm wants to discuss consideration of an alternative test method they believe is equivalent to or more stringent than that set out in the 16CFR1203 standard. The meeting will be held 1:30-2:30 at the CPSC's National Product Testing and Evaluation Center, Conference Room 103, 5 Research Place, Rockville, MD 20850. For additional information contact Andrew Stadnik, astadnik@cpsc.gov. Transmitted to the Office of the Secretary 5/24/17. Posted in the Public Calendar 5/24/17. (S)"
We asked to attend that meeting, but it was then cancelled, and another meeting arranged that excluded the public under CPSC's "proprietary technology" rules. On December 17, 2017 Hovding petitioned the Consumer Product Safety Commission for an exemption to the CPSC bicycle helmet standard. We sent out a newsletter when the petition became public three months later, on March 10. We have submitted detailed comments opposing the exemption in response to the CPSC request for comments on the petition. You can see those and some of the other responses on the Regulations.gov web site. And you can see the Hovding petition for exemption from the CPSC standard. In some impacts the airbag would not deploy before the head was struck: truck and bus mirrors, bridge abutments, overhanging limbs, signs, etc. Post-impact deployment could make injuries worse. Abrupt reversal of direction is implicated in concussions. Wearability and comfort are not assured by the open air photos. Some who have tried our sample thought that the weight and shoulder/neck position are less comfortable for them than a conventional bike helmet. Would it be sweaty in hot weather, since there is no ventilation between the wide collar and the chest? The designers complain about helmets feeling like a "mushroom" on their head, but millions of riders wear helmets comfortably, and this device around your neck might be worse. Durability is a question: there is a statement in the company's instructions about not being able to wash the collar that we do not understand. The Hovding should not be immersed, so leakage of water into it is possible in bad rainstorms. Could it interfere with neck flexibility while riding? While crashing? Could it injure the rider's neck as it deployed? Charging the battery is required for the headgear to deploy. Riders often forget to charge phones and bike lights. Would they remember their Hövding despite its alarms? Phones and most bike lights have alarms too. If it died, would they continue the ride with no airbag? Would a rider remember to turn the mechanism on for every ride? Any conventional helmet is ready to protect when strapped on. It is not possible to answer questions based on the manufacturer's Web site and video. If the device can detect all crash scenarios, the mechanism could be used to deploy other forms of protection for other body parts. APC Helmets has an airbag system in a motorcycle helmet, but they have fitted the airbag to deploy under the helmet as a neck support in the event of a crash. In that case if the airbag does not deploy you still have the protection of a conventional helmet. Hit Air has a system with an airbag jacket that deploys when a rider is thrown from the motorcycle and a tether is yanked. The problem is that in some scenarios the airbag will not open, as when the motorcycle and rider crash together into a barrier or go down simultaneously to the side. For equestrian use it might not deploy if the horse rolls on the rider. Perhaps the greatest significance of the Hövding is that at least somebody is trying to solve the head protection problem for riders who will not destroy their hair styles. The non-helmet might also help to address the problem encountered by shared bike programs. Shared bike programs all over the world are in need of an easily transportable helmet or one that can be dispensed from vending machines at very low cost for users of shared bicycle programs who did not think to bring a helmet or do not want to carry one. There are now several fully-certified folding helmets available. But the Hövding does not meet US standards and is expensive. If the Hövding can be improved it could be an advance.